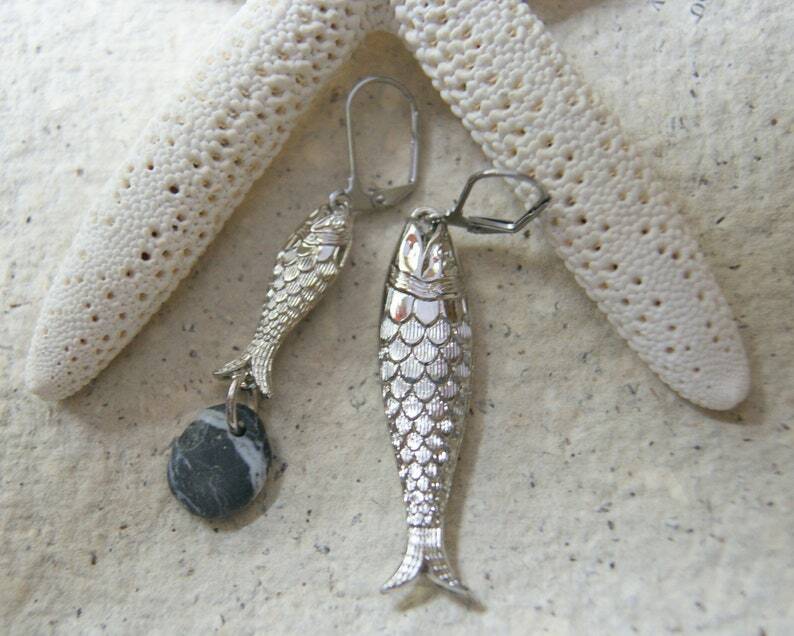 Mismatched vintage silver colored Lucite fish hang from stainless steel leverback earwires. The larger fish hangs 2 1/2". The smaller fish is combined with a black and white wishing stone (beach stone) and hangs 2 3/8". This is my stock photo for this listing. Each pair with have a black and wishing stone that is the same size as this one. Very lightweight! All jewelry comes in rustic kraft gift boxes tied with bakers twine, jute string or wrapped in washi tape. You can see my current gift wrap samples on my about page. Leave me a message when you check out to let me know which paper you'd like. If you don't leave a message, I'll happily choose one for you.